Many of you know, Ol' Myrt here has early LDS Church members on her Dad's side of the family, while her mom's side typically is found in the same places, and are rumored to tar and feather those of the then unusual "new" religious group. 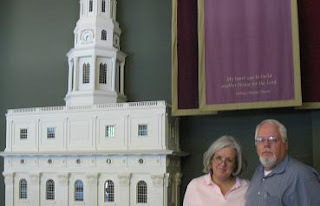 On our trip back to Virginia this week, Gordon and I made a point of stopping at the Mormon Trail Centre at historic Winter Quarters (Omaha, Nebraska), the graveyard and temple. I took the picture above from the parking lot of the visitors' center looking west to the graveyard on the hill behind the iron fence. 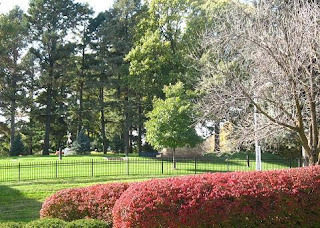 Winter Quarters is where my pioneer ancestor David Dutton Yearsley (born 3 Mar 1808 at Thornbury, Chester County, Pennsylvania) passed away in 1849. His widow Mary Ann (Hoopes) Yearsley and children were then faced with traveling to the Salt Lake Valley on their own.They were part of the Benjamin Hawkins Company, departing 5 June 1850, arriving 9 September 1850 in a band of some 150 wagons that were in the company when it began its journey from the outfitting post just across the Missouri River at Kanesville, Iowa. I had previously studied the history of the westward migration of early LDS Church members, and knew of the difficulties of the temporary housing at Winter Quarters. I also knew that Yearsley's grave was unmarked, as were many who lost their lives during this difficult time in early Church history. There were just too many to bury in a short period of time, and too few methods for marking the graves when wood was needed to keep the home fires burning. Thinking only of the Yearsley side of the family, imagine my surprise to note the very first display in the Winter Quarters visitors' center features a quote from my not-very-famous William Warner PLAYER, a stone setter immigrant from England who worked on the temple at Nauvoo, Illinois from June 1840 until the Church members were forced to leave the city during the icy cold month of Feb 1846. Subsequent study in the library of the visitors' center yielded the book An intimate chronicle; the journals of William Clayton edited by George D. Smith. Clayton detailed some of William Warner Player's stone work, carvings and placement of the unusually large east window. It must have been heart -breaking to leave Nauvoo, knowing that mobs had forced their way into the stone temple desecrating the interior and burning what could catch fire. It is only in recent years that a new temple has been erected on the same site. Regardless of one's religious orientation, it is enlightening to understand the motivations of an ancestor's life. 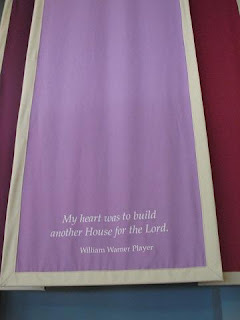 Indeed, William was able to fulfill his dream "My heart was to build another house for the Lord." Although he was quite elderly, and his son Charles was much more active in building the Salt Lake Temple, William did manage to put some time into it's construction. Temples have a special meaning to members of the LDS Church. My sister and I still carry on the traditions set forth by our Yearsley and Player ancestors. Thank you so much for all the information you provide! Especially in today's entry. I had the same feeling when I stumbled upon the display myself about a year after you did.